While a dog is a faithful companion, with a book in your hand you’re also in good company. 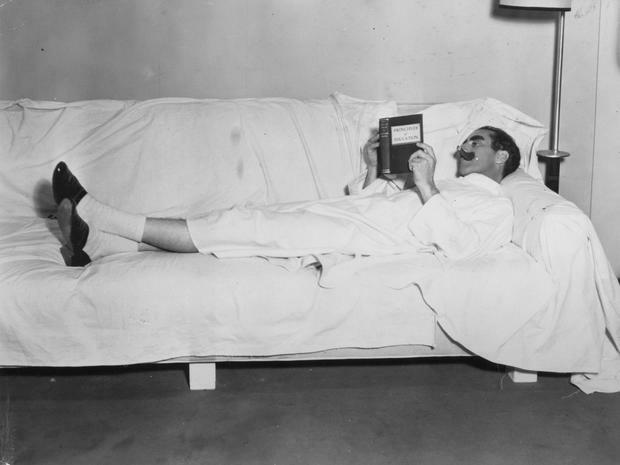 Groucho, who with Chico, Harpo, Gummo and Zeppo made up the hilarious Marx Brothers, was already a keen reader when poverty forced him to quit school at 12, overcoming his lack of formal education by becoming well-read. Recent studies confirm young Irish people are also keen readers. Great credit for Ireland’s love affair with books must go to the authors, who make a huge contribution to the ‘Writers in School’ scheme. Since Listowel’s Bryan McMahon first visited the Mercy School in Limerick in 1977, the year Groucho died, a million young people in 4,000 schools have reaped the benefits of this unique programme. These talented authors have inspired young people to read not only for information, but also for pleasure. Social media is all pervasive, but it’s hard to beat a good book. Reading exposes one to adventure, excitement, anticipation and knowledge. It stirs the imagination, arouses curiosity and inspires creativity. Digital media and literature can co-exist, but young people should always be encouraged to read a good book and, in the words of author Tom McCaughren, “discover the magic between its covers”. Book shops throughout the country have an eclectic supply to suit all tastes. What more appropriate Christmas present can be given to a child than an introduction to the joy of reading with the gift of a book? There is also an excellent public library service where books to suit all tastes can be borrowed. Membership of the local library makes an ideal stocking filler and introduces the recipient to a lifelong love of reading. Although Groucho insisted he would “never join any organisation that was willing to accept him as a member”, he regularly borrowed books from his local library, albeit incognito under his real name – Julius Henry Marx. Legal, medically safe abortion is better than the illegal kind and certainly better than exporting the issue, as we have always done so well. No abortion, nor abortion service, is worth celebrating, however, in my opinion. What would be well worth celebrating would be reducing the demand for all abortions, legal and otherwise. Given that human nature is unlikely to change any time soon, safe reliable contraception – preferably LARC (long acting reversible contraception) – must be made universally available and at a similar (or lower) cost to the patient than an abortion. Someone has gotten somewhat carried away judging from the headline ‘Brexit transforms Ireland from minnow to giant in the Anglo-Irish relationship’ (Irish Independent, December 1). Objectively, the advent of Brexit will have the opposite effect; transforming Ireland from being a “minnow” to a nearly invisible “pinkeen” or “plankton”. At present, the proportionate population of Ireland to that of its much larger island neighbour, the UK, is one to 10; post-Brexit, Ireland, on its lonesome (sans the UK), will be proportionally one to 100, compared to the remaining 26 EU member states. Being aligned (unofficially) with the UK gave Ireland a status and profile, within the EU and wider world, well above what was warranted by its size and development. Also, it should be borne in mind that when Ireland joined the EU in 1973 (then called the EEC) there were only six member states. Ireland was the small “younger European child” and carried a reputation of being, historically, a brave little Catholic nation of saints and scholars standing up to the Protestant British bully. Whatever about the scholar bit, the saint bit is now in the gutter. Fasten your seat belts, interesting times lie ahead, as Ireland comes to terms with reality. Paul Ferris’ letter (‘The British people can have no one to blame but themselves for Brexit mess’, Irish Independent, November 30) shows he has no real idea why the UK voted to leave the EU. It was never about money – it was about regaining freedom from the bureaucracy of the unelected rulers of the EU. The UK has fought to retain independence in two World Wars (for which all modern EU states should be grateful) to be free to control its borders and seas and trade wherever it chooses. Ireland, on the other hand, despite its much vaunted “struggle” for self rule, was happy to “sell its birthright for a mess of pottage”, proving it had no principles that cash could not buy. Being an EU vassal state is fine as long as (someone else’s) cash keeps rolling in. Currently, Ireland cannot even control its own interest rates and will soon find that EU “budgetary control” and a “Unified Tax Regime” will destroy the current economy. A recent comment that EU membership “enabled Ireland to take her place among the nations” was presumably made with a straight face, but anyone who imagines that with just 4.5 million of the EU’s 300-odd million people, Ireland could be granted a place of any significance is deluded. The EU wants to keep the UK’s billions, scientific and military support and pillaging rights over UK waters. (Ask the Germans if they care about losing their enormous UK trade surplus). To deride the 17.5 million who voted to leave displays an arrogance only matched by an unprincipled venality of outlook. Not wishing to play Scrooge, I cannot resist bringing attention to the amount of plastic in the novelties and games on the ‘Late Late Toy Show’: do you think the children who grow up in a world devastated by waste will thank us? The Ghost of Christmas Future is present.